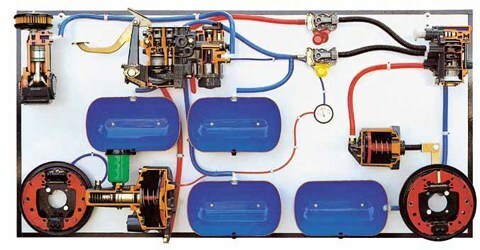 Wall panel showing the hydro-pneumatic braking elements of a truck (tractor-trailer) complete with: air compressor, triplex Marelli distributor with adjusting and control unit, pressure brake booster, tractor trailer coupling joint, hydraulic control braking element, mechanical and air control braking element for parking braking, servo-distributor valve for the trailer, no. 4 air reservoirs (3 for the tractor). All elements are connected with rubber pipes of different colours to distinguish the various circuits.